Ron Barry is a doctor of dental medicine who specializes in general and cosmetic dentistry in Del Mar, CA. He is the owner and operator of his private practice, Ron Barry, D.M.D. With over 35 years of experience, Dr. Barry is exceptionally skilled in all aspects of dentistry and treats a wide variety of oral conditions. Dr. Barry is extremely thorough in his patient care and treatment planning. He is genuinely concerned that each patient receives the utmost care and is properly informed on all aspects of their treatment so they can make the best decisions for their dental health. When you visit Dr. Barry, you can rest assured that you will be treated like family. As a highly trained dentist, Dr. Barry is adept in performing simple and comprehensive dental procedures. He specializes in general, cosmetic, restorative, and advanced dentistry. He offers a long list of treatments, including CEREC one-visit restorations, dental implants, porcelain veneers, crowns, inlays, onlays, and Clear Correct aligners. Other services include professional teeth whitening, sleep apnea treatment, and night guard therapy. Dr. Barry also trains local dentists who are interested in learning the integration of 3D radiology and implant planning. Dr. Barry graduated from the University California, Los Angeles with a degree in psychobiology and continued his education at Tufts University School of Dental Medicine in Boston, MA. After receiving his D.M.D. degree, Dr. Barry returned to California, where he practiced in North County. Dr. Barry later relocated to Del Mar, CA, where he opened his own private dental practice. Dr. Barry is widely recognized for his expertise and excellence in dentistry, which has earned him multiple decorations. He was nominated "San Diego's Leading Dentists" by San Diego Magazine and "Best Cosmetic Dentist" by Ranch and Coast Magazine. 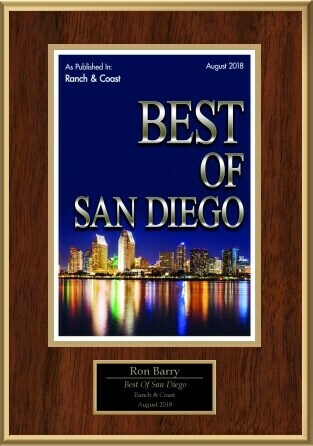 He is easily regarded as one of San Diego's top dentists. Dr. Ron Barry is a seasoned family dentist in Del Mar, CA who specializes in general, cosmetic, and advanced dentistry for adults and children.